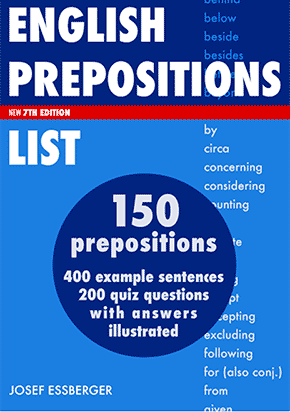 The people of Mexico were among the first to develop agriculture. Around 10,000 years ago early Mesoamerican cultures that later developed into the Mayan civilization grew crops like corn (also called "maize"), beans, tomatoes, sweet potatoes, chayotes and other squash, avocados and papayas. These foods are still the basis of Mexican cuisine, and Mayan foods still eaten today include a thin flatbread made from cornflour called a tortilla, and an easily-carried snack called a tamale in which a meat or vegetable filling is wrapped in a corn husk. Mayans also grew cocoa beans to make chocolate drinks like champurrado that are still popular in Mexico today. But this was just one of many periods in the history of Mexico. By the 13th century, Mayan culture had declined and most of Mexico was governed by the Aztec civilization. The Aztecs built some of the biggest and most magnificent cities in the world at the time, with their capital city Tenochtitlan being five times the size of London in 1500. The cuisine of the Aztecs was similar to Mayan cuisine, but with ingredients like chilli peppers, salt and honey now used more widely. 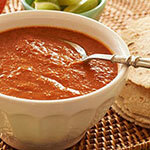 They used chilli peppers to make a hot and spicy sauce called salsa that's still popular in Mexico today. They poured salsa on fried tortilla strips to make chilaquiles, one of the most famous of all Mesoamerican dishes from the Aztec period. In the 16th century, Mexico was invaded by soldiers from Spain. Within a few months millions of Aztec people had been killed by the soldiers or died from the diseases they brought. This made it impossible for the Aztecs to resist the invasion, and when the Spanish destroyed their capital city of Tenochtitlan in 1521, it signaled the end of thousands of years of Mesoamerican civilization and the beginning of Spanish rule. Along with their deadly weapons and diseases, the Spanish brought foreign animals like sheep, pigs and cows for meat and dairy foods like milk and cheese. 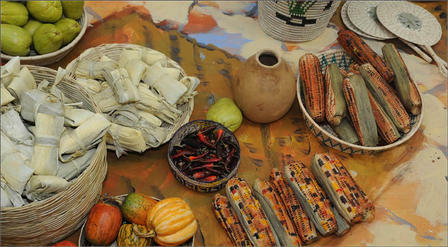 They also brought foreign plants like wheat, rice, onions and garlic as well as new spices. Since then, Mexican cuisine has combined the Mesoamerican cuisine of Mayans and Aztecs with the European cuisine of Spain. If you visit Mexico today, you'll see many snack foods being sold from carts, trailers and street stalls. These foods are called antojitos and many are also served in Mexican restaurants, either as appetizers or in main course dishes. 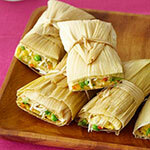 Many of these antojitos are made with tortillas and fillings of various kinds. 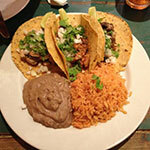 They include meat or vegetable-filled tacos, cheese-filled quesadillas, deep-fried tacos called flautas, chilli sauce-covered enchiladas, and toasted tortillas called tostadas covered in various taco-style toppings. 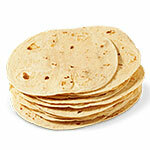 Tortillas are also used in an American variation of Mexican food called Tex-Mex (from Texan and Mexican). Tex-Mex dishes are tailored to American tastes, with more of the ingredients Americans love such as grated cheese, fried onions, refried beans and lots of meat. 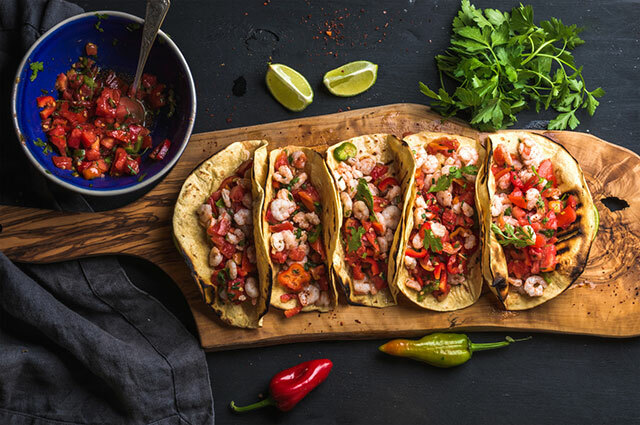 They include tortilla wraps filled with meats and beans called burritos, spicy fajitas stuffed with grilled meat, fried onions and chilli peppers, cheese-topped tortilla chips called nachos, and beef or chicken tacos made with prefabricated hard-shell tortillas. 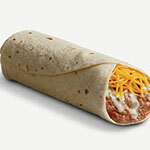 Fast food restaurants that sell Tex-Mex food like Taco Bell® have spread across the USA and are now spreading around the world. These places are becoming more and more popular, but if you want to try real Mexican food go to a proper Mexican restaurant instead. Many of the main-course dishes you can order in a Mexican restaurant are made with tortillas or tortilla chips, but not all. 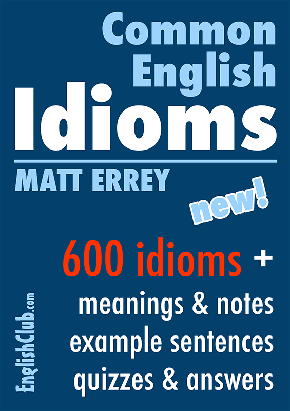 Exceptions include a spicy dish of beef and beans called chilli con carne, stuffed cornflour pancakes called gorditas, a traditional beef-stomach soup called menudo, a marinated fish or seafood dish called ceviche, stuffed peppers deep-fried in batter called chile relleno, and pork or chicken carne adobada flavoured with the delicious adobo paste. 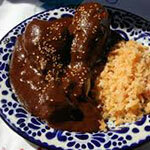 Another traditional flavouring is mole, a chilli-based sauce that's used in popular dishes like mole poblano chicken. If you order any of these dishes as a main course it should come with condiments like salsa mexicana or salsa roja, a bowl of guacamole avocado dip, pepita pumpkin seeds, sour cream to cool the tongue and a hot sauce to spice things up. 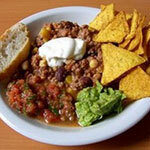 You should also get side dishes like a bowl of shredded lettuce and some diced or sliced tomato and onion. If you visit Mexico you'll have no trouble finding delicious pastries and desserts. No matter where you go you'll find sweet pan dulce breads and pastries like the strips of deep-fried dough called churros that many people eat for breakfast, usually with a cup of hot champurrado. Pan dulce pastries can also be ordered in restaurants, as can traditional Mexican desserts like capirotada, a delicious oven-baked bread pudding. 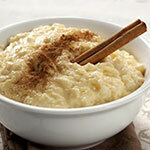 Others include a creamy rice pudding called arroz con leche, a rich caramel custard known as flan Mexicano or Mexican flan, and deep-fried pastries called sopapillas that are usually served with ice-cream. adobo (noun): a paste or marinade of chillies, vinegar, herbs and spices for flavouring meat or fish - This pork adobo's really good, isn't it? antojitos (noun): Mexican street foods and snacks, sometimes served as appetizers in restaurants - Antojitos are sold in street stalls and markets all over Mexico. Aztec (adjective): of the Mesoamerican civilization in Mexico when the Spanish invaded - Mexican food is a mix of Mayan, Aztec and Spanish cuisines. burrito (noun): a tortilla that's folded over and filled with meat, beans and cheese - They sell the best burritos in those old markets. 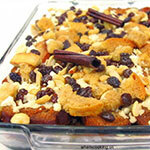 capirotada (noun): a dessert similar to British bread pudding - Would you like some capirotada for dessert? carne adobada (noun): meat or chicken covered with a spicy adobo paste or sauce - If you order carne adobada, get a side salad as well. 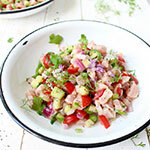 ceviche (noun): an appetizer or main course dish made of marinated raw fish or seafood - If you're making prawn ceviche, use freshly-squeezed lime juice. 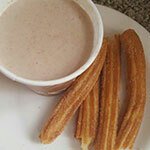 champurrado (noun): a warm, thick, frothy Mesoamerican chocolate drink - Would you like champurrado and some churros for breakfast? chilaquiles (noun): a dish of fried tortilla strips topped with a salsa or chilli sauce and cheese - Shall we order chilaquiles as an appetizer? 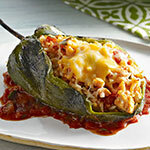 chile relleno (noun): stuffed chilli pepper covered in batter and deep-fried - Javi makes really good chile relleno. chilli con carne (US spelling "chili") (noun): a stew made of ground beef, beans and fresh or powdered chilli - If you order chilli con carne, say you want it "mild". churro (noun): a strip of sweet fried dough sprinkled with sugar and cinnamon - Having churros for breakfast isn't very healthy, is it? 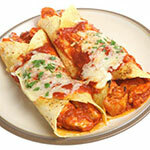 enchilada (noun): a tortilla with a filling of meat or cheese served with chilli sauce, eaten as an appetizer or main course - Enchiladas have been part of Mexican cuisine since Mayan times. 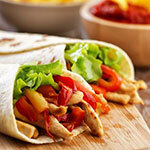 fajita (noun): a Tex-Mex dish of cooked meat slices, onions and peppers rolled up inside a tortilla - The fajitas come with lettuce, sour cream, guacamole, salsa, and grated cheese. flauta (noun): a tortilla filled with meat and cheese and then fried - I'll have the flautas and a beer, please. 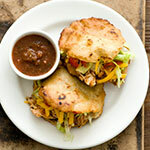 gordita (noun): a thick cornmeal pancake filled with meat, cheese or vegetables - Let's get a vegetable gordita as well. 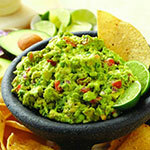 guacamole (noun): a thick green dip or sauce made from mashed avocado - Can you teach me how to make guacamole? Maya or Mayan (adjective): of the Mesoamerican civilization in Mexico circa 2000 BC to 1300 AD - Many of today's Mexican dishes are from Maya cuisine. 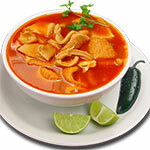 menudo (noun): a spicy Mexican soup made from beef stomach - Mexicans love menudo, but most foreigners don't like it. Mesoamerican (adjective): related to the civilizations in Mexico and Central America before the Spanish invasion - Mesoamerican farmers have been growing maize for over 10,000 years. mole (noun): a rich sauce made from chilli peppers and other local ingredients - There are many varieties, but my favourite is "mole poblano". 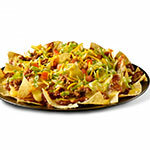 nachos (noun): tortilla chips covered with cheese and various other ingredients - Nachos were invented near the border of Mexico and Texas in the 1940s. 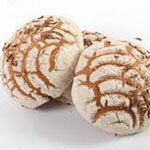 pan dulce (noun): any of the sweet breads and pastries sold in Mexican street stalls and restaurants - There are hundreds of different panes dulces, and they're all delicious! 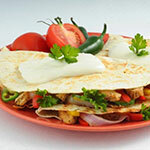 quesadilla (noun): a cheese-filled tortilla that's grilled, with vegetables and spices sometimes added - Quesadillas are like a Mexican version of the grilled cheese sandwich. 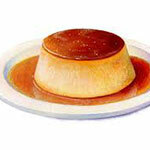 salsa (noun): a spicy sauce made from tomatoes, onions, chilli peppers, etc. - Could you pass the salsa, please? 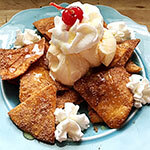 sopapilla (noun): a small, pillow-shaped fried pastry dough mostly eaten as a dessert - Could I have sopapillas with vanilla ice cream, please? 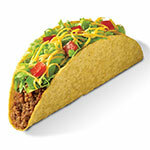 taco (noun): a folded or rolled tortilla filled with minced beef or chicken, beans, spices, etc. - I don't like the hard-shell tacos they sell in Tex-Mex fast food joints. tamale (noun): a Mayan dish in which a filling of meat or vegetable is rolled in cornmeal, wrapped in a corn husk and then steamed or grilled - Don't forget to bring the tamales, will you? Tex-Mex (adjective): of a type of food in which Mexican dishes are tailored to typical American tastes and ingredients - There are Tex-Mex restaurants in Asia these days. tortilla (noun): a thin flatbread traditionally made of cornflour, but also made of wheat flour since the Spanish invasion - I got some tortillas on my way home. tostada (noun): an appetizer made of tortillas (often old or stale) that are toasted and used as a base for taco-style toppings - The shrimp tostadas were really delicious.